The flowers of our Aloe barbadensis are perhaps the most favored blooms in our entire collection by an assortment of insects and birds. Members of the Lily Family, all Aloe species feature succulent rosettes and tall spikes of red and/or yellow flora. 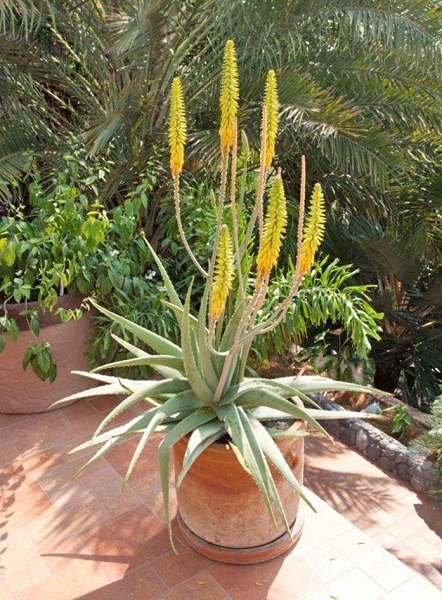 In fact, the flowers of our Aloe barbadensis are perhaps the most favored blooms in our entire collection by an assortment of insects and birds. I’m certainly no ornithologist but I believe a couple of regular visitors to our plant are a Wedge-Tailed Sabrewing Hummingbird (Campylopterus curvipennis) – I’m not making these Latin names up – and the magnificent Hooded Oriole (Icterus cucullatus). Aloe is a rather large genus with more than 300 species of succulent herbs, shrubs and trees. They are often mistaken for plants in the Agave family. Generally they bloom in the winter – ours around February through May – and should receive a minimum of watering during their dormant season. Woops, that would be during our rainy season! While most of these different species come from Africa, this variety originally came from the islands northwest of “The Dark Continent”, the Canary Islands, Madeira and Cape Verde Islands. As a result of its “home roots”, it is drought tolerant, sun loving and appreciates well-draining soil. Note the Aloe’s two foot, lanceolate, light green leaves that are toothed with soft spines on the margins. Most all of us are familiar with its medicinal qualities in the treatment of skin abrasions and burns. But it is also used in cosmetics, shampoos and, as W. Arthur Whistler states in his book “Tropical Ornamentals” – that can be ordered through our site – its use as a cathartic purge dates to before Alexander the Great, 356 – 323 B.C. I’ve also read that, in 1500 B.C., the Egyptians used it for burn treatment, infections and parasites. It’s my understanding that aloe gel was used by Cleopatra to keep her skin soft and young looking. As for the guys, it’s still used by hunters in Africa to reduce perspiration and body scent. The Spanish carried Aloe from Europe to South America and the Caribbean and it was introduced to the West Indies at the beginning of the 16th century. 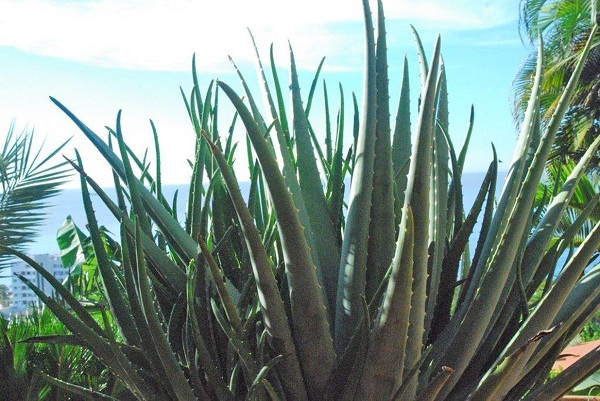 Spanish missionaries in these realms planted Aloe around their settlements and carried it with them to aid the sick. These blooming tall spike of yellow flora are just opening up. And, from what we can tell, it looks pretty much the same now as it did then with erect, two-foot lanceolate, light green leaves that are toothed with soft spines on the margins. 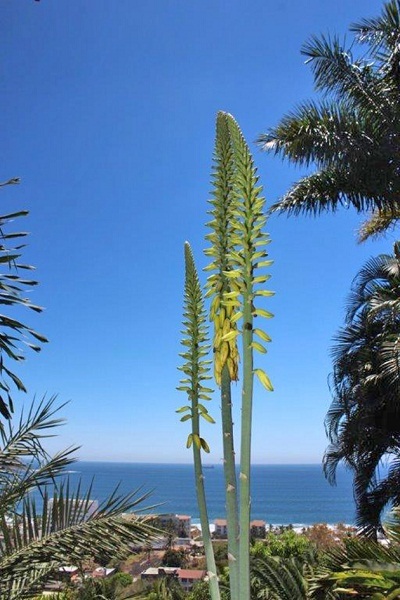 Its deep yellow flowers hang down from tight cylindrical clusters atop three foot tall spikes. Care should be taken before using Aloe Vera, as contact dermatitis can occur in some, more sensitive individuals. When using it topically for a burn, cut away the skin and inner layer of yellow juice leaving only the actual gel. That yellow juice, particularly in older plants, is the principal cause of contact dermatitis. Hence you may wish to test a small area of skin, prior to general use to see if you have an adverse effect. So now, knowing what you do about Aloe barbadensis, you’ve decided that you must have some! Where should it be planted? They do best in warm, sandy soil with good drainage which will reduce the risk of root rot. In containers, Aloe Vera does well in a mixture of commercial potting mix with extra sand, granite grit or perlite or can be planted in cactus potting soil. When planting outdoors, find (or make) a sandy spot that dries out completely after watering or rainfall. OK, sorry but I simply can’t help myself sometimes! What was the product in early 1950’s commercials – one in which a young Angie Dickinson was featured – where the jingle sounded much like this “Aloe everybody, aloe. Aloe is the …”? And you thought you were here just to read about great tropical plants!